I decided to make this one after seeing the real one at the Boston Exhibit. 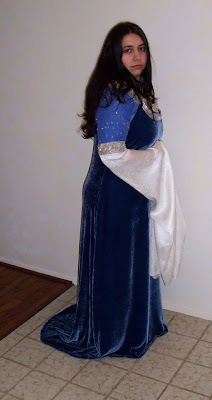 I hand-dyed silk velvet for the jumper, and silk satin for the underdress. 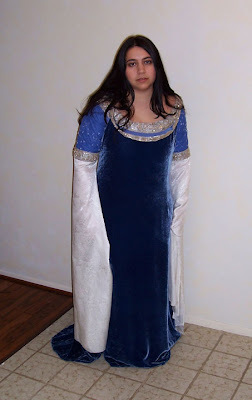 The uppersleeves are made from silk chiffon overlayed on china silk. I embroidered them with the flower pattern seen on the real costume, and hand beaded them. The lower sleeves are silk jacuard. The trim on the underdress and jumper is a silver trim with bullion and sequins. It's not exact, but a decent match for the real trim.